This happened in 1938, a year after the famous unrest in the shtetl. Czyzewo was once again peaceful. The Jews were trying to keep body and soul together, trying to make a living in commerce or as laborers. The youth dreamed of going to Israel and their parents had worried faces and bowed shoulders. In the hunt for any odd job nobody had time for serious thought. Nobody paid attention to the sea of enemies that abounded around us. An evening’s entertainment had been planned for officers returning from maneuvers. I was invited and could not refuse to attend. The evening’s entertainment took place in the “Rolnik Hall”. The officer noticed the change in me and tried to end the conversation. He actually ended our talk by saying that the Jews are very bright and there was even a period, a long time ago, when they brought much needed knowledge to the country…but today times are hard. The people are needy and hungry and the Jews are living well on the backs of the Polish people. I became angry which paralyzed my tongue. The words stuck in my throat. At that moment I decided that it was time to leave Poland. The words of this “polite” officer persecuted and whipped me. They spit in my face. Was this then the only time that it was made clear to me that there was no place for Jews in Poland? There were worse situations and more painful, but the deliberate manner in which the officer spoke that happy evening surpassed in vicious truth every slap until now. I left the officer standing there with his fancy boots and went home through the sleeping Czyzewo streets thinking back on my entire life in the shtetl. I think of how the Christian population benefited from us and instead of gratitude I saw the bared teeth of an animal that waits for the moment when the country will be “freed” from the Jews and allow them to go on a spree with Jewish property, with Jewish blood. I remember a dawn in 1926. A red flag was hanging at Lubelczyk’s house. This brought the police and terrible troubles. The police took out their anger on the Jews in the shtetl. At first light somebody knocked on my door. Two policemen came in and carried out a search. They knew they would not find anything in my home. Still they searched with such intensity as if they would find an arsenal of weapons in my house. When they stopped the search everything was upside down as if there had been an earthquake. One of the policemen said that they were searching for Communist literature in my home. He said this with a straight face, but his thoughts were viciously mocking me: we know that you are rich and have nothing to do with those who want to overturn the government and think you are their enemy. But you are a Jew and therefore we will stick you with everything possible. The entire day in Ostrowa I was questioned about my connection with hanging the red flag and the Communist party. After bothering me for a day and a night they finally let me go home. It was already Friday afternoon when I arrived back in the shtetl. The Jews stopped me and peppered me with questions. My arrest seemed a bizarre event to them. They saw this as an omen of difficult times ahead. The Jews stood there for a minute staring, then frightened turned and went on their way. I stood there alone, not saying a word to the Chief of Police who had more than once received fat bribes from me and now it seemed that he absolutely did not want to remember. The sky was getting dark and the flames of the Shabes candles could be seen in Jewish windows. The entire shtetl fell into a holy quiet. I immediately forgot the disturbing and insulting experience. Jews dressed for Shabes in silk and satin kapotes [long, black coat worn by Orthodox Jews] were going into the synagogue with the young boys lead by the hand or following behind, dressed for Shabes. It warmed by heart. No, in those days I did not think about leaving the shtetl. As the years passed more and more young people thought about leaving. 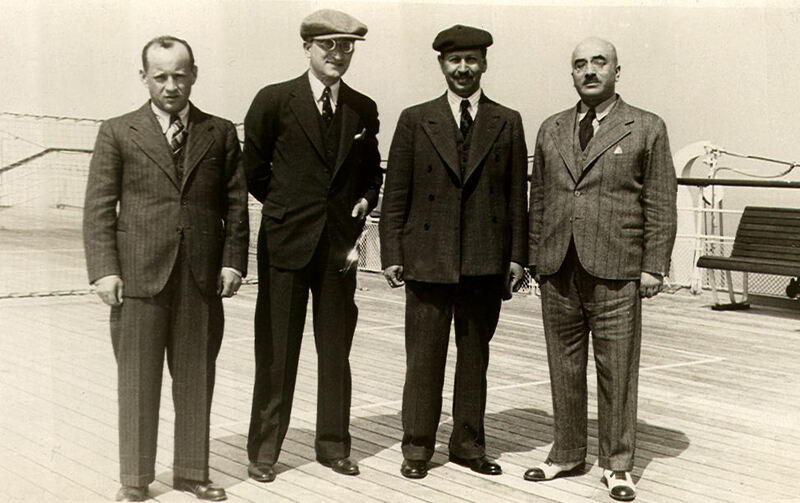 Halutzim [pioneers to work collective farms in Israel] left for Israel and others went to America. Houses that had stood here for generations were now deserted. Deserted by fathers, a man or a grown son. The youth organizations carried on heated discussions, disputes, hearing ones fill about parties, ideology and programs. But all of them already carried deep in their hearts this yearning to be a part of the world at large, to re-build their lives on new foundations. At that time suddenly a pogrom broke out. It started with those picketing during a Tuesday fair. The young mischief-makers were from the estates and villages. The majority, led by students, stood at the Jewish stores and watched so that no peasant would enter. When the signal was given, a entire gang, organized and well prepared, with sticks and poles, set off for the Jewish stores. The air was full of screams. The fighters were yelling and those beaten were wailing. The police intervened and captured the hooligans. But the same day a disturbance broke out in the horse and cattle market. There were a lot of badly wounded and a dark cloud of need and want hovered over the shtetl. The final hope of making a living ran out. The idea of leaving became stronger. At that time a committee was sent to Czyzewo from Warsaw in order to determine the cause of the unrest. They were disguised as peasant and went into the villages, among the workers, spoke for a long time with them and wanted to find out why they wanted to throw out the Jews. This person who had so philosophically spoke about the common people was perhaps ashamed to mention those who incited the people. The great majority of the newspapers published in Poland sympathized with these hooligans. Also the Polish intellectuals in our shtetl did not show any understanding or sympathize with the Jews, but just the opposite, they were vile, false and hypocrites. A month before the war, in August 1939, the possibility of travelling to America came about. The famous exhibition was taking place in New York. I never thought that the war would break out in approximately a month. Even though the political situation was strained, nobody thought that the Germans would actually attack Poland. I had already decided to have a look at America to see whether it would be possible to stay there and leave Poland forever. However I did not take any money with me. I travelled light. This would prove to be a mistake. After arriving in America I decided to stay there. I felt like a shipwrecked man who swam to a strange shore. I had no one to turn to. The entire first year in America I worked at night in a bakery. The conditions were terrible and the work – very hard. But not for one minute did I lose hope and I waited for the opportunity to use the initiative that was in me. After a year I went into business for myself. Carefully I set up the business for which I had all the qualifications from the old country where our mill was known throughout the region. In the mill business I was a specialist and I went into the flour business. I had to overcome a lot of difficulties that stood in my way. The most difficult of all was the question of working papers that I did not have. I put all doubts behind me and the flour business was not bad. I mainly bought flour for export to South American countries. Later, I also went into leather. But that is a whole other story. I stopped feeling so lonely and began meeting Czyzewer landsmen. Azriel Belfer, who had left Czyzewo many years before already had a fine business, a well-organized meat business belonged to Berkowicz. Mostly I met them in the Andrzejewer Synagogue where the Czyzewers prayed every Shabes. After prayers we talked about Czyzewo and shared the news about Poland that everyone received through various means. Then the idea of bringing the Czyzewer rabbi to America was brought up. Really we were already looking for ways to get papers for him. Later we realized what a naïve idea it was. We had not given any thought to the great pain the rabbi had gone through with the other Czyzewer Jews in the ghetto that existed then and was already doomed to extinction. At that time we received the first news of those Jews who had wandered through various countries and were searching for a safe haven. We received news about the Jews who were waiting in Vilna at the consulates of various countries. In America there was intense activity. From everywhere men were prepared to help the Jews who were trying to save themselves from Hitler’s Poland. Then we thought about the rabbi’s son-in-law, Rabbi Lewinsohn. This brought a lot of joy. We got right down to work and began to organized papers that would allow the rabbi to come to America. When our work was crowned with success there was quite a celebration. Rabbi Lewinsohn arrived in America from Shanghai at the height of the war. He arrived together with his wife and son. The rabbi’s daughter, Fradel Lewinsohn is today one of the most active among the Czyzewer women in America. People cannot mourn forever. For a long time we simply did not want to believe that this could happen. An entire Jewish community wiped out, murdered in such violent deaths. But it soon became clear that it was true. We were crushed and shaken up. But soon we received news about the individuals who were still alive, who had been saved from the gray hell. And what if people had thrown up their hands and given in to sorrow? To start with I sent packages. Then I had the idea that I must do everything possible to bring these people to America. Among those I brought to America at that time were Zelig Gromadzyn, Jankiel Mankita, Zysze Slucki, Israelke Fenster and my sister Perl Spaleniec who brought us the news of the dreadful pogrom that occurred in Czyzewo. Their faces spoke louder than words, the terror and fear in their eyes. Today these people are installed, working, earning and have re-built their family nests. But the sorrow that they experienced is buried deep in their hearts and will never leave them, will always be there as a reminder and a warning. And so the deep ties to our shtetl, that was a ring in the generations long chain of Jewish life in Poland, cannot be erased. It was and is no more. When the axe of Hitler’s executioners was let loose on the Jewish people in Europe, our branches also were cut down. Jewish Czyzewo is no more. A city with Jews was destroyed in great pain, in inhuman agony. We will never forget, write and tell about it …in memory of the people.